South Lampung, Indonesia – The wedding party was in full swing when Andi Karim heard the sounds of fierce waves slamming the shore of his village in western Indonesia. 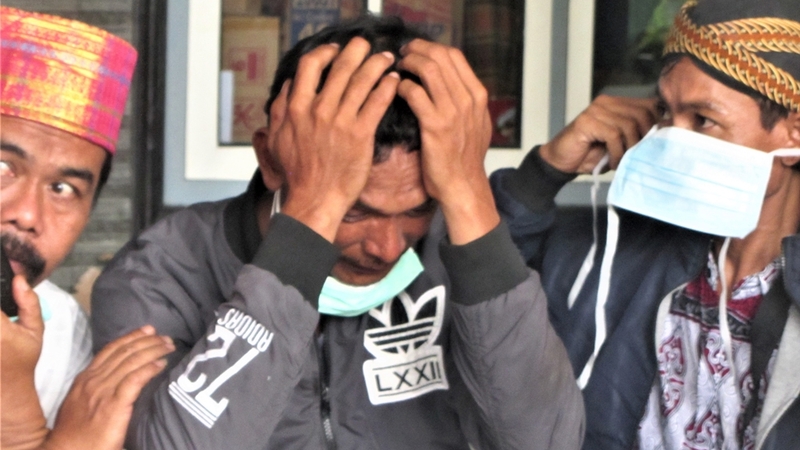 The 32-year-old’s instinct kicked in immediately, prompting him to spring towards his home on the waterfront where his 33-year-old wife Putri Anita and his five-year-old son and three-month-old daughter were sleeping. “When I got inside the house, I saw that the waves had knocked a cupboard on top of my family. My wife was holding it up so they didn’t get crushed,” Karim told Al Jazeera. His family was alive – but trapped. The small plywood cupboard had fallen on their mosquito net, pinning them to the bed. “My wife was holding the cupboard so it didn’t fall on the baby, but she couldn’t get them out from under the net,” Karim said. Rajabasa village had just been hit by a powerful tsunami that on Saturday night battered the Lampung and Banten provinces on the Indonesian islands of Sumatra and Java, respectively. The huge waves are widely believed to have been triggered by an underwater landslide caused by an eruption from the neighbouring Anak Krakatoa volcano which sits in the Sunda Strait. At least 430 people have been killed, more than 150 are still missing, and thousands have been displaced. 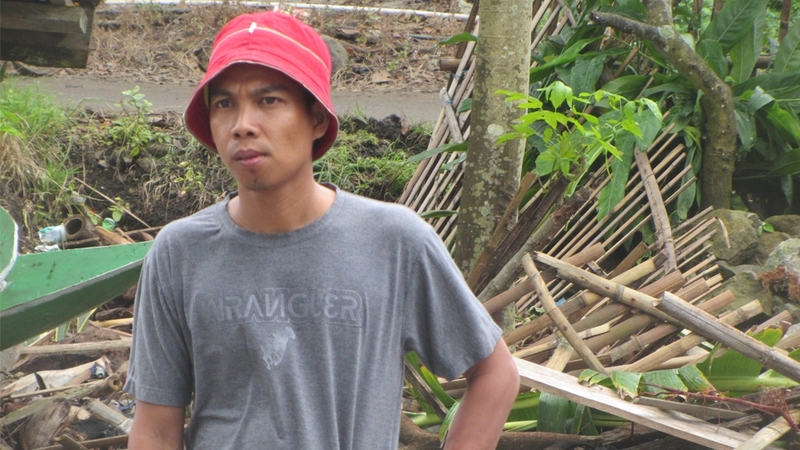 Karim managed to lift the cupboard off his family and get them out of the house as another violent wave bore down on the village in South Lampung. On the same night, some two kilometres away in the coastal village of Way Muli, Sabandin Bin Hasimun was at his neighbour’s house. “I heard water rushing up the beach, which was unusual, so I went outside to see what was happening. A second wave came on the horizon and it was so big,” the 38-year-old told Al Jazeera. Bin Hasimun immediately started running down the waterfront in the direction of his family home, where his wife, Munajah Binti Nurdin, 31, and their two youngest sons – Muhammad Rifki Al Lapis, two, and Ahmad Dinata Adi Saputra, eight – were all asleep. But he couldn’t make it. Bin Hasimun was washed against a low wall next to the main road. He managed to grab hold of it. “That’s what saved me being swept out to sea,” he said. When the water subsided and his gaze turned towards his house, he saw that it had completely disappeared – gone by the surging wall of water. “I thought another wave would come so I ran away,” said Bin Hasimun, who eventually managed to scramble to higher ground. The next morning, the body of his two-year-old son was found on the beach. It took until Tuesday for his wife’s remains to be recovered at Kunjir village, around a kilometre away. Remarkably, his eight-year-old son had woken up by the sound of the sea and fled the home before the waves came. “He took the initiative to save his own life,” said Bin Hasimun. His eldest son, 11-year-old Ahmad Dwi Hadi Saputra, was at a football camp in the provincial capital of Bandar Lampung when the tsunami hit and is now being looked after by his football coach. He has yet to be told that his mother and youngest brother perished in the deadly waves. 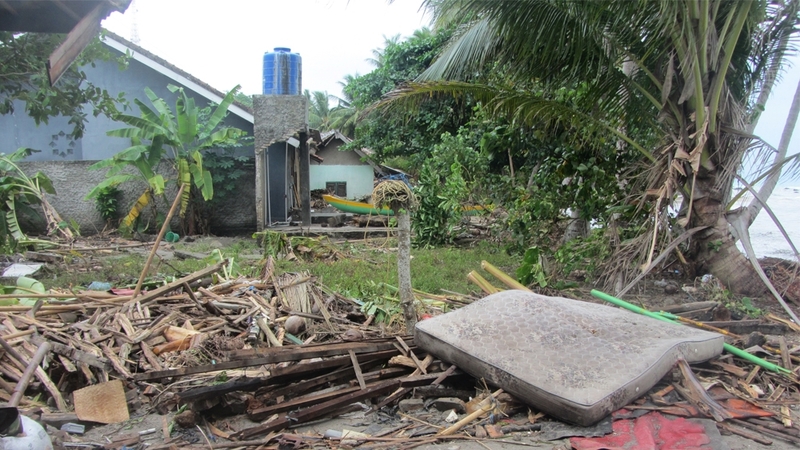 Out of the 108 tsunami victims in South Lampung, 22 lived in Way Muli. Dr Eddie Dempsey, a lecturer in structural geology at the School of Environmental Sciences, University of Hull told Al Jazeera that the waves and the water are in fact the least hazardous part of tsunamis. “Tsunamis really are terrible events … The most dangerous part is the debris and sediment picked up by the wave which is churned around like in a cement mixer,” Dempsey said. Rescuers are continuing to find bodies along the coastlines of Lampung and Banten and the burial process is ongoing. Helicopters, drones and sniffer dogs have also been deployed to find survivors and victims in remote areas, as recovery teams scramble to distribute much-needed aid to those sheltering in mountainous makeshift camps amid official warnings to stay away from the coast due to the prospect of the rumbling Anak Krakatoa causing another tsunami. On Wednesday, Bin Hasimun attended his local mosque where he was comforted by friends as paramedics unloaded the body of his wife on a stretcher so that local residents could say prayers before her burial. Her body, almost unrecognisable due to decomposition caused by the water, had to be wrapped first in a traditional white Muslim funeral shroud and then in a plastic body bag to avoid it leaking. The prayers had to be cut short as the smell of death in the mosque was overwhelming and caused members of the crowd to cough. Bin Hasimun was urged by concerned friends not to attend the burial for fear that it would be too upsetting. Having lost his wife of 13 years, he says he’s feeling “lost”. For the moment, he is staying with family friends on higher ground in Way Muli, but is too shocked to know what to do next.